The first thing I notice after disembarking from the canoe that carried me across the Curbaradó River and scrambling up the bank are palm oil trees. Their rows of short, stout trunks topped by long green fronds stretch as far as my eye can see. I am visiting the Curbaradó River basin, located in Northwest Colombia near the Panama border, precisely because of the bitter struggle between afro-descendant farming communities and the palm oil companies that had taken over the land after the communities were violently displaced, yet I am taken aback by the overwhelming presence of palm oil trees, destined to become ingredients in cosmetics and snack foods. I soon turn my gaze to the military checkpoint a few meters from the river bank. I also know to expect this, and after years traveling in Colombia’s conflict zones, it doesn’t faze me much. My companions and I are waved through their gate made of guadua, a bamboo relative. The soldiers are part of the perimetral protection that Colombia’s Constitutional Court ordered last year as part of a process to restore the land to its “ancestral” inhabitants—those displaced afro-descendant farmers. A few more meters down the path I see a white flag suspended on a very long wooden pole. Shortly after, we approach a sign just behind a line of barbed wire fencing announcing the Humanitarian Zone of Camelias. We enter through the gate, passing between two houses suspended a few feet above the ground. I later learn, after hearing some gruesome snakebite tales, that the height protects from snakes, as well as from flooding during the rainy season. After finding the house where we’ll be staying and guarding our groceries from all the tropical bugs in clear plastic tubs, I sit down to talk with Cristóbal Reyes. His baggy dark blue oxford shirt doesn’t hide his slight frame, and he regularly checks his watch to see if it’s time for us to leave to accompany him part of the way back to his home in Nueva Esperanza (New Hope), in the neighboring Jiguamiandó River basin. He doesn’t hesitate, however, when I ask him to tell me about the violence that led to the displacement of all the Afro-descendant and mestizo campesinos – small-scale farmers—in Curbaradó and Jiguamiandó river basins, starting in 1996. “[There were] bombings, bombings, some planes flew overhead and bombed the area, and well… and killing, killing campesinos. We were afraid so we got together and we left,” Cristóbal recounts. 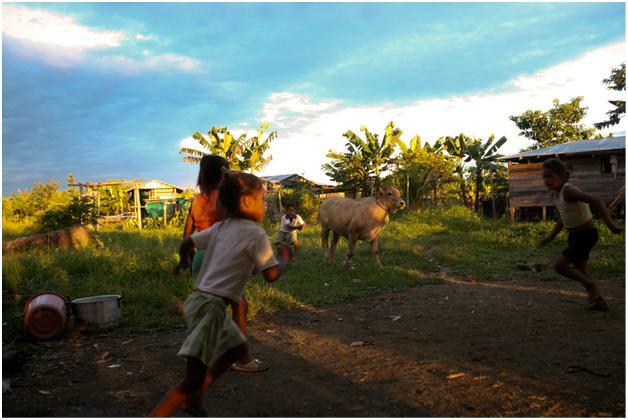 This violence was part of military operation, known as “Genesis,” that left the region ravaged by deaths, disappearances, looting, burned villages and thousands of displaced campesinos. Accounts from now-demobilized paramilitaries who participated and campesinos who lived it confirm the complicity of the paramilitaries and the Colombian Army in the violence. Many families displaced to nearby towns and cities, where they stayed with family members, when possible, or, in the case of many, in makeshift and depressing camps. For example, hundreds of displaced families lived for months in the soccer stadium in the town of Turbo, where at time food didn’t arrive for weeks and people had to subsist on bananas from trees in nearby fields. It wasn’t until 2006 that the first organized group of families decided to attempt to return to their lands in Curbaradó. Those 14 families, led by a campesino from the area, Enrique Petro, decided to set up a “Humanitarian Zone” on five acres of Petro’s land. Knowing that the region was still a dangerous place, the families would live inside this demarcated area and prohibit entrance to all armed actors as a tool of self protection based upon the principles of International Humanitarian Law. When those 14 families arrived, however, they found the surrounding land converted into enormous palm oil plantations. The palm oil growers claimed that they had merely taken over land newly uncovered when the river shifted its course a bit during the time the campesinos were displaced. Were that really the case, according to a government official, the river would have had to have moved 17 kilometers (about 10.5 miles) to account for the 17,720 hectares the Colombian government has deemed illegally obtained. The campesinos bravely uprooted the palm oil trees on their land and began planting their corn, bananas, rice and yucca. Now, eight Humanitarian Zones and fifty Biodiversity Zones (another similar mechanism of civilian and environmental protection) dot the river basins of Curbaradó and Jiguamiandó. Those that have their eye on it—palm oil growers, cattle ranchers, and drug traffickers—have pulled out all the stops to force the campesinos off the land. In 2009, Benjamín Gómez, an 80-year-old local community council member, was murdered by presumed paramilitaries. Argenito Díaz, a spokesperson for a region-wide community council, was murdered in 2010 by presumed paramilitaries, after having received threats in 2008. Houses and crops have been burned, and other community leaders have received multiple threats over the years, including Ligia María Chaverra and Enrique Petro. Despite an order from Colombia’s Constitutional Court to return all lands to their rightful owners —the campesinos who first settled it—these threats and attacks continue. In fact, in early August of this year, two campesino men from the region, Francisco Pineda and Everto González, appear to have been disappeared. Both men were members of community councils, and family members of Pineda have fled the zone out of fear. As of the writing of this article, the whereabouts of Francisco and Everto remain unknown. augment and even I success you get admission to consistently rapidly.